Eggs & Cheese $12.95 per ft.
Bacon, Eggs, Cheese $14.95 per ft.
Turkey, Egg Whites, Alpine Lace Swiss $15.95 per ft.
Western with Cheese $15.95 per ft.
Condiments and Paper Goods Included. Sternos, Loan of Wire Racks & Urns. Tea Bags, Cups, Milk, Sweeteners, Stirrers and use of Urn. Fresh Plum Tomatoes, Red Onions & Fresh Herbs diced in a light Vinaigrette & surrounded by Toasted Flatbreads. Assortment of gourmet Cheeses & Pepperoni served with seedless Grapes and Crackers. Assorted Melons, Strawberries, and Grapes Colorfully Arranged. 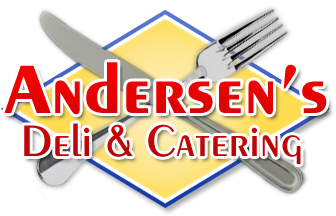 Grilled Vegetables, Roasted Peppers, Italian Meats & Cheeses, Fresh Mozzarella & Tomatoes, Assorted Olives & Breadsticks. Assorted Seasonal Vegetables Beautifully arranged with our Delicious Ranch Dressing Dip. Jumbo Shrimp served with Our Chef's Favorite Cocktail Sauce. Marinated Chicken On skewers served with Thai Peanut Dipping Sauce. Seasoned, Char grilled Eggplant, Squash, Red & Yellow Peppers, Red Onions & Asparagus. Fresh Mozzarella, Sliced Tomatoes, and Fresh Basil with Olive Oil & Balsamic Vinegar. A Variety of Flavors to Choose from; Our Wings are Always a Party Favorite! Choice of Salads. Heroes are Cut and Toothpicked, Available on Boards or in Baskets. OR One Green Salad: Caesar, Garden, Greek Toss. Heroes (Look below for choices) or combine any 2 for a Gourmet Half & Half! American, Italian or Half & Half on bakery fresh Italian Bread with Dressing on the side. Choose one of our selections below or combine any 2 for a Gourmet Half & Half! (F) Chicken Caesar Grilled Chicken, Parmesan Cheese, Romaine Lettuce and Caesar Dressing. An assortment of Gourmet Deli Sandwiches on specialty Artisan Breads. Potato, Macaroni, Cole Slaw, Italian Pasta, Ranch Pasta, Penn Dutch, Tortellini, Tomato. A Variety of Flavorful Wraps including Grilled Chicken, Grilled Vegetables, Boar’s Head Cold Cuts and more. Potato, Macaroni, Cole Slaw, Pasta, Penn Dutch, Tortellini, Tomato. Fine Boar’s Head Cold Cuts and Cheeses beautifully arranged on a garnished Platter. Also includes Pickle & Olive tray, Plates, Napkins, Knives, Forks, Serving Spoons, Potato Chips & Pretzels. Choose up to 10 ingredients from our Chopped Salad Bar. Served in a Large Bowl with your choice of Dressings. Traditional Deli Sandwiches on White, Rye & Whole Wheat Breads, cut, toothpicked & beautifully arranged on a garnished platter. Potato, Macaroni, Cole Slaw, Italian Pasta, Greek Pasta, Penn Dutch, Tortellini or Tomato. Also includes Pickle & Olive tray, Plates, Napkins, Knives, Forks & Dressings. *Minimal Charge may apply based on Order Size and Location. **Deluxe Selections available as part of our Hot Buffet Package for an additional. $1.50 per person per selection. If you don't require a full buffet package, you can order trays of food 'a la carte'. A full tray feeds approximately 12-15 people. A half tray feeds approximately 6-8 people.